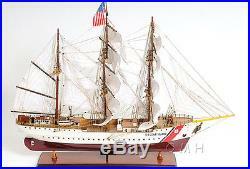 This is an exclusive edition of the US Coast Guard Eagle, where the model is uniquely identified by a laser cut hull serial number. 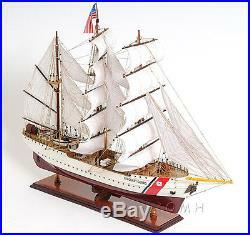 Coast Guard model is handcrafted from beautiful wood exotic wood. The hull is constructed using a plank on frame method, each strip of exotic wood are carefully joined together to form a smooth hull. This model is completely hand built to spec by skillful and creative master craftsmen; you will be amazed at how real it looks. They are all connected to numerous fabric sails with detailed stitching, all rigging are painstakingly fastened by hand in matching colors. The Wooden machine with metal chain used to secure and dropping anchor are at the beakhead. Theres a large wooden cabin with 4 doors on the main deck. On the quarter deck, theres a navigational area with metal steering wheels, 2 wooden boats, and a wooden cabin. An additional metal steering wheel can be found on the poop deck. The beak deck and the quarter-deck are surrounded with metal fences. You can easily spot the U. Coast Guard symbol and letters on the side of the hull, and lots of metal rings on above of the waterline. An attached wooden stand with a nameplate engraved U. 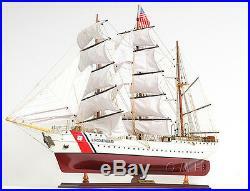 S Coast Guard is standard on this model. Our model was built according to scale through original plans, pictures, and drawings. We absolutely use no plastic parts only the highest quality wood and metal parts. 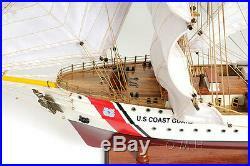 Coast Guard model comes fully-assembled and ready to be displayed. 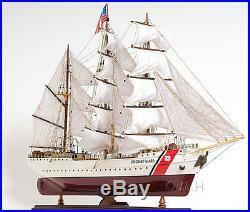 The USCGC Eagle (WIX-327) (ex-SSS Horst Wessel) is a 295-foot (90 m) barque used as a training cutter for future officers of the United States Coast Guard. 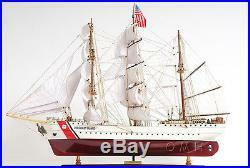 She is the only active commissioned sailing vessel in American military service. She is the seventh U. Each summer, Eagle conducts cruises with cadets from the United States Coast Guard Academy and candidates from the Officer Candidate School for periods ranging from a week to two months. Often, Eagle makes calls at foreign ports as a goodwill ambassador. 36″ (long) x 12″ (wide) x 28 (high), scale 1:125. Condition: New (fully assembled). Ready to display, not from any sort of kit. Made of finest exotic tropical wood. 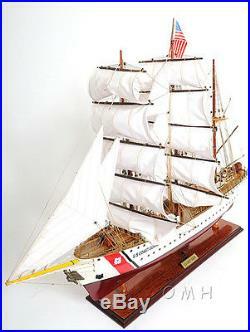 Hundreds of hours were required to finish this model sailboat by skillful craftsmen and artisans. Individual wooden planks used in hull construction using plank on bulkhead method. Highly complex rigging with varied thread gauge, hundreds of blocks and deadeyes. 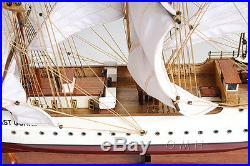 Figurehead, cannons, anchors, bell, propeller and other fitting made from metal and/or brass. Solid wood base and brass name plate included. Guarantee to arrive safety. Professional 100% secure packing. Missing and loose parts are not considered damaged or defected. We will send you extra parts with instruction. The actual items colors may vary from colors shown on your monitor. Listing pictures were taken from prototypes. Item(s) in stock might slightly different from the listing pictures. There are no two models looks identical. 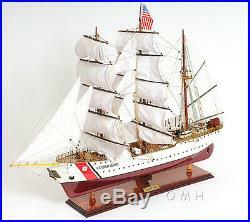 The item “USCG Eagle US Coast Guard Tall Ship 36 Built Wooden Model Assembled” is in sale since Wednesday, May 11, 2016. 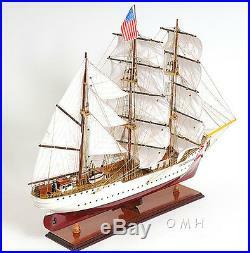 This item is in the category “Collectibles\Transportation\Boats & Ships\Military\Models”. 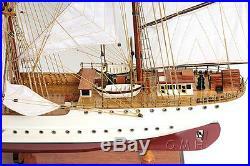 The seller is “atlantisgift” and is located in New York. This item can be shipped to North, South, or Latin America, all countries in Europe, all countries in continental Asia, Australia, New Zealand. Size: 36″ (long) x 12″ (wide) x 28″ (high), scale 1:125.